It seems quite difficult to obtain a precision compass, because most shops only sell more or less simple compasses, but they can order one for you if you know which type you want. 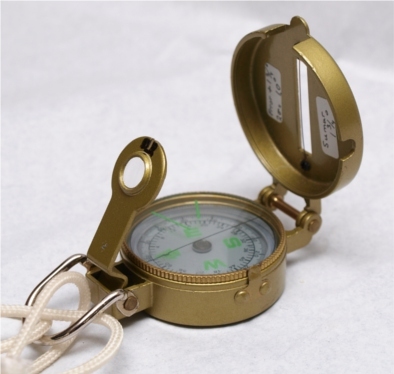 At the end of the page you will find some links to manufacturers and sellers of compasses. 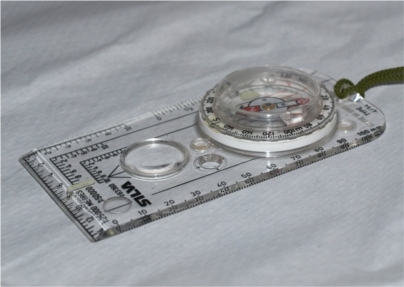 There are three types of precision compasses: with a lense to look on top of the compass dial, with a lens to look at the side of the compass dial, and with a prism to look on top of the compass dial (although they also have a lens). Then there are compasses with a mirror, but, in general, they are less precise; if your eyes are older, like mine, it can be a problem to look at the mirror (at 30 centimeters distance) and at the landscape beyond at the same time. For measuring directions on the map we can use a protractor larger than the compass dial; this will be more precise than the compass. 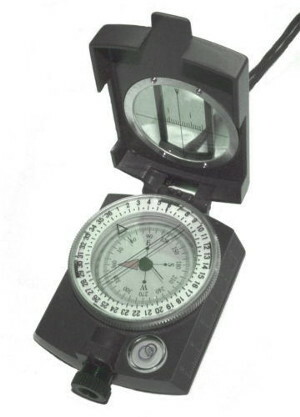 Some compasses are not transparant and it is imperative to use a separate protractor for precise measuring. It would be a pity to loose the precision from your expensive compass by using its small bezel as a protractor on the map. Most precision compasses are take-and-look compasses, much simpler and faster to learn to handle than baseplate compasses. The lensatic compasses of the American army are robust, but because the scale interval is 5 degrees their precision in degrees is not very high. They also have a scale in mils with considerably more precision, so one should use a protractor with a mils scale or one should convert mils to degrees and use a normal protractor. With the same eye you look alternatingly at the landscape and then at the compass dial. Reflections on the transparent top often make reading the scale difficult. At one side of the housing is a scale of 1 : 25.000. They got an electrodynamic dampening, to stop the oscillations of the compass dial, that is really very fast (1-2 seconds after a 45º deviation), and they have a fine index line which increases precision. However it has a parallax of 10 mils or 0.6 degrees. (Parallax is the difference in scale reading with different eye positions. Other compasses in this article have 0.0 to 0.1 degrees parallax.) For use at night there are two variants: compasses with "tritium", a slightly radioactive substance that causes some parts of the scale to be fluorescent, and compasses with phosphorescence, that have to be illuminated a couple of seconds with a torch before you use them. 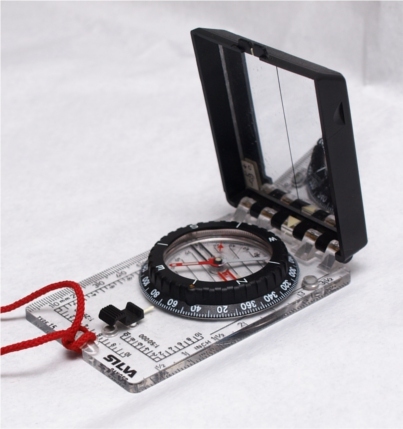 Although you can find cheap imitation compasses, their quality is difficult to judge, whereas the official army compass comes with high quality axis. I have some 40-year old imitation compasses with a friction of 4.5 degrees. That means you can pull away the needle 4.5 degrees (with a magnetic object, like a knife or screwdriver) and it won´t return to its original position. When you carry gloves in winter, you will have to take them off to open and hold this type of compass. 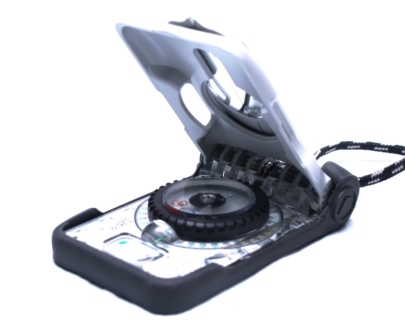 There are imitation models with and without liquids to stop the dial; without the liquid you can tilt the compass so the dial touches the bottom of the case and will brake. They can be adapted to your eyes by changing the position of the lens. 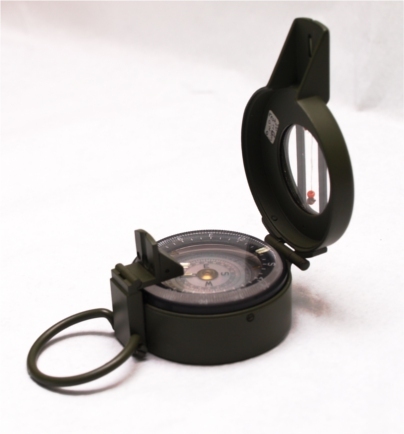 - K&R Corporal: the same idea, but round, plastic and less robust than the army compass. - K&R Ranger: the same idea, round, metal. The round models have no scale for measuring distances and their precision is not very high, but it could be improved with some work (drawing a fine index line on the capsule - you can see it on the photograph) and calibrating them after replacing the capsule. Without these changes I don't recommend them for precision work. A relative advantage for working in degrees is that they have the degrees scale on the outside of the dial. Wilkie: now it carries the name K&R Meridian; it has served me many years. 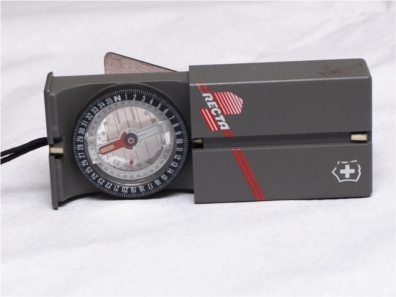 It has good precision, is robust, but it weighs more than 300 grams including it´s sturdy leather pouch (much, compared with the 100 grams of other compasses). In my case, after 25 years, the capsule has shrunk and the dial no longer turns. I have replaced the capsule with that of the much cheaper KR Alpin Pro and again it is doing reasonably well. You will have to take off your gloves in winter. It has an adjustible prism. There is a model similar to the Wilkie made by K&R and/or by Konus with an adjustable lense instead of a prism. Recently I saw an imitation of these models, without brand name, at a price of 20 euros. First impressions are that this imitation is sensitive to tilt. The imitation model has a level, but this is only useful when you carry a tripod; when you look through the lense you can´t see the level. The distance between the scale and the index line is too large, you can´t focus on both of them, this reduces their precision. It weighs more than 200 grams. The scale division is 1 degree, without a larger line at 5 degrees, which makes it more difficult to read the scale. The notch for sighting the wire in the cover is too wide, so it is difficult to see the wire. The dial seems not well balanced, sometimes you have to tilt the compass so much that you can´t see scale and landscape feature at the same time. Dampening is reasonable, 6 - 7 seconds after a deviation of 45º. 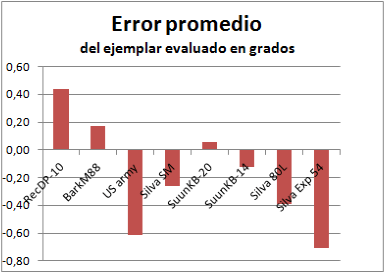 Friction is very bad: 3º, in the professional models it is 0º. This means you can deviate the needle 3º from its equilibrium position and it won´t return. It has a parallax of 1 degree. Well, for a price of 20 euros you should not expect high quality. Remember I am talking about the no-name brand, not about the original K&R or Konus types, which I did not test. Recta DP-10: has a prism, and I don't understand why it also has a mirror, except for combing your hair. The match box models always come with their old problem of air bubbles, very annoying in the mountains when you want to measure the direction toward a somewhat higher mountain top: the bubble places itself where you want to read the scale. You can use it directly on the map, although it's not very transparant, the protractor is very small and is of poor visibility. It also has a clinometer, but it is not very precise. You can use it in winter with not too thick gloves. This compass presents the opportunity of comparing the precision of the mirror and the prism: acoording to my measurements the prism is seven times more precise! 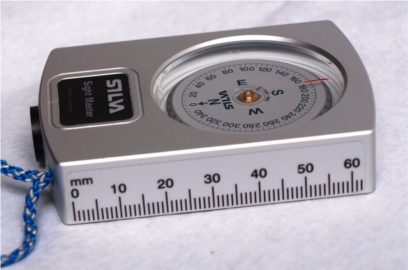 Silva Expedition 54: a base plate compass, but it also has a prism. You can measure directions on the map, because it is transparent, much more than the Recta DP-10. The optics can't be adjusted. It has scales, a magnifying glass, and you can measure coordinates on maps of scales 25.000 and 50.000. 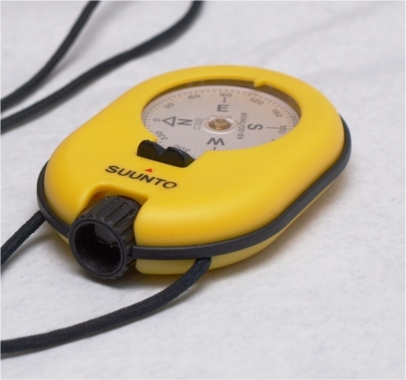 Suunto KB-14: it is not transparent, so you will need a separate protractor to measure directions on the map. It has an adjustible lense. You have to use both eyes: the right one looks at the compass dial and the left one looks at the landscape. It seems that not everybody manages that easily, so try it out before you buy. The housing is solid, but the window above is somewhat fragile; I always carry it with a card, like a credit card, in its case. I once have broken the capsule and had to send it to Finland to have the capsule replaced. There are rubber covers to protect it against shocks (shown here with a yellow cover). 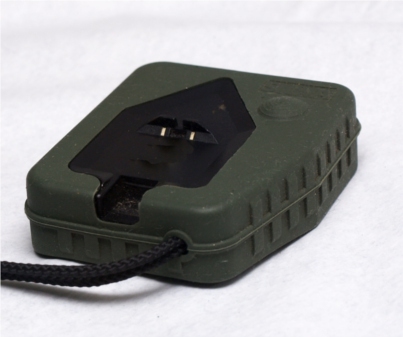 There is also a KB 14 RB with a litium battery to use at night. Suunto KB-20 Vista, it's also sold under the name Recta (the trade mark Recta now belongs to the Suunto company). It only weighs 42 grams. It has adjustable optics. You can use it with gloves, you just take the compass and look. You can use it with one or two eyes. A lot cheaper than the Suunto KB-14 yet it seems as precise. Silva 80 L: you can use it with either two eyes or one, but with two eyes it suffers from parallax. It is more precise using only one eye, centering the index line in the notch on top of the compass. It has a very legible scale. You can't see the dial directly, only through the lense. It comes with a rubber cover to protect it against shocks. It is a compass to take and look, you don't have to take off your gloves in winter. It is slow to stop oscillating (12 - 13 seconds after a 45º deviation). Silva SightMaster: It looks like the Suunto KB-14, but you can't adjust the lense. Silva SM 360 LALU with litium battery for use at night. There is also a variant with a prism instead of a lense. Francis Barker M-88 y M-73, of the English army, with tritium, more than 250 euros. It is a very precise compass, but be careful to hold it horizontally, you can't see whether it is horizontal like in most other compasses. Keeping it horizontal is important because it seems that the scale reading changes one or two degrees with some inclination of the compass. I tried it in Holland, but it still has to be seen how it is in the mountains, when signs of horizontality are absent. Well, in the mean time I have concluded that its readings are quite sensitive to inclination of the compass. I have glued a fishing line in the cover with two beads and a piece of solder as weights. You can see them in the photograph. This is a lot better! Now I can hold the compass perfectly horizontal. It also suffers from static electricity: sometimes the dial sticks to the bottom of the capsule and you have to tap it with a finger to loosen the dial or throw water over it. 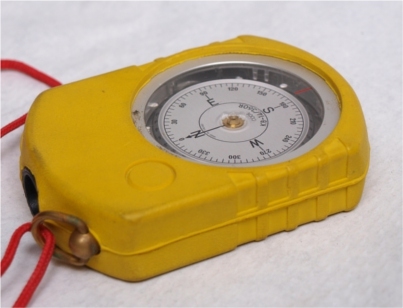 It is one of the slowest compasses to stop oscillating (11 - 12 seconds after a 45º deviation). Brunton Eclipse, with mirror, is a special type. You will have to take off your gloves to use it. K&R Dakar Touring, with lense, like those of the US army, but is made of transparent plastic. K&R Alpin Pro, with prism (and lense) like the Wilkie or Barker, but much lighter; you can't adjust the lense (like in the Wilkie), but with some work it might be possible. Another way to use it is to hold it at some 30 centimeters from the eye. It has no index line, nor a sighting point or notch. There are "transits" of high precision for geologists, but they are very expensive and they are much too heavy for trekking. 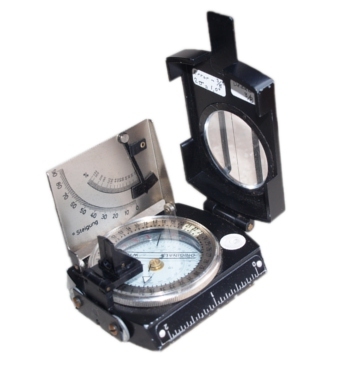 There are also combinations of compasses with clinometers (for example the Silva Ranger with mirror - see top of this page - and the Recta DP-10). My favorite, as an instructor, for the preparation of exercises (I have to be more precise than my students), is the Suunto KB-14, but the Silva 80 L is also very good. 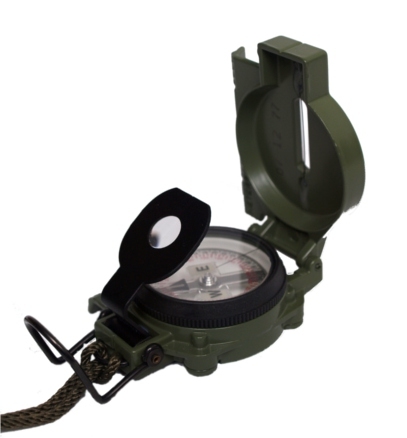 The US army compass - the original from Cammenga - also is precise when you can work in mils. The Suunto KB-20 is lighter and cheaper than the KB-14 and seems quite good. If you do not want to carry a separate protractor and ruler and if your eyes are good, the Silva Expedition 54 may serve you. When you use a conventional protractor, that is, with degrees, buy a compass with degrees; for some models there are variants with a mils scale (or even "grads", where a circle is divided into 400, mainly a French invention). Remember that we are talking about compasses for precision work, you can always (I do) carry a second small compass which is more rapid to use during the march, for example, a wrist compass. The following graph shows the error margin of some compasses. The error margin has been defined as two standard deviations of 49 measures at 7 places in the Netherlands, so that 95 % of the measurements fall inside the indicated interval. All measurements were made sitting on the ground, knees drawn up and elbows on the knees, for a stable position. The US army compass measurements were done with mils, then converted to degrees; using degrees would be much less accurate. The Barker and Recta may be expected to be less precise in mountainous areas. Another thing is the average error of a specific compass, we would have to measure several exemplars to judge the type of compass. 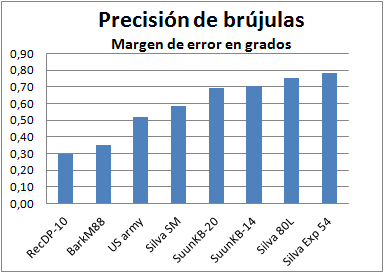 A big average error of one single compass may indicate inaccuracies in production, a small average error does not indicate an accurate production. I had to measure the average error of each compass in order to be able to correct for it. I put a sticker somewhere on the compass with the correction to apply, e.g. "add 0.4º". Prices: I can only give very rough ideas of prices. Some compasses I bought years ago, I paid for them in German marks, French francs, US dollars, British pounds, Euros, exchange rates may have changed in the mean time; for some I had to pay postage.